Assembly Begins Parts, parts, parts, nothing but parts! 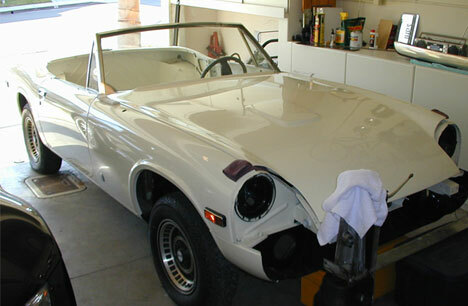 A restoration can seem a daunting project at times. My first reaction to a body shell and boxes and bins of parts is to try to assemble everything at once. This is of course quite foolish as it results in almost nothing getting done and increased frustration! Much better to subdivide everything into series of small projects and build on that. I've spent many hours going through boxes trying to sort nuts, bolts and other pieces. The car was brought home in boxes so I'm only finding out now what's here and what's not. Naturally, if I need eight nuts for an assembly, I can only find four or five. From my previous Jensen ownership of some 16 years I can pretty much tell at a glance what bit belongs where. I can't hardly imagine how I'd figure out this giant 3-dimensional jig saw puzzle otherwise. The bumpers on this car were in sad shape and looked to have taken the brunt of abuse over the years despite the fact that most of the car is in pristine condition. Front and back were twisted, dented and just plain badly beaten. A plea for help on the Market Place of the our web site resulted in clubber Ed Buchanan in Bonita California offering me a reasonable cost on a good rear bumper ($58 shipped). Im in the process of removing all the trim and nuts off this, there always seems to be something frozen or stripped that needs extra work. Ive done some pounding on the front bumper and this may be usable as is. These will be put aside for a while and added to the large pile of items awaiting a trip to the powder coating shop. I've tried to purchase new gaskets for the handles and locks, but these are NLA. Instead, I made a trip to my local, so-called, auto parts store and did find some very heavy-duty, thick (1/32) fiber-gasket material this seems actually a little better than the original paper gaskets that existed and I proceeded to fashion new templates on my computer to cut out and use. These worked out well and turned out to be an exact fit. If anyone needs templates for this you can find them online (see above). The dreaded Jensen Healey floorpans- why do these things give owners so much trouble? Weight and cost effective production techniques where key elements in the J-H formula. As an added bonus, quality control in the early 70's was atrocious in the auto industry across the board. This combination made the floor pans a major casualty. We all know that paint 30 years ago was pretty poor in quality and any kind of underbody protection (what under body protection?) was not much of a concern. The J-H floor pans have vent holes in them, presumably to allow moisture to go somewhere, but these where plugged from the factory and any benefit they they may have provided was non-existent! The inevitable water leak from the windows would allow water to soak into the carpets and build up and soon rust formed on the paper thin and barely painted pans and did it's damage all too quickly. Methods for fixing include complete front to back replacement with new stampings (the cleanest, but most expensive route- $500-$2,000 depending on whether you do the work or pay a body shop to do everything), spot repair with metal (which will also require welding), and fiberglass repair that you can easily do at home in a weekend. If holes have not yet formed you may be able to simply scrap away the loose chunks of rust and use a product like POR- 15 which seals and converts the rust to a very hard, durable, they say porcelain-like, and water proof finish. I've done some long term, 5 year, testing on my patio support brackets which I'll report on next month. My project car, through some freak of nature, has intact floorpans with virtually no rust, so it's a priority for me to keep it that way. The body shop had given the car a light mist over the pans and admitted that their attempt in this area was rather sparse. This was about the time they had realized that they had exceeded the budget by a wide margin. Since the car had been left in the rain a few times before the trip to the paint place (grrr), it did now have some minor surface spots. I've used POR-15 before and it does a great job, but it's not cheap and it's not available locally. I hit my local home improvement store and picked up some Rustoleum Rust Reformer and some Rustoleum white enamel paint which I brushed on. These proved more than adequate for my needs- I really just needed a reasonable surface prep and top coat to prevent future rust. Now, if moisture should be hanging around it will stay on top of the paint and eventually evaporate. Please remember to leave the floor pan plugs out of the car so can drain if even needed! Reattaching the side marker lights onto the body took much longer than I though was possible. Little bits needed to be found in old paper sacks and organized into piles. The lenses where a bit dirty so everything was cleaned well on both sides with plastic polish, the chrome bezels were polished with metal polish and the rubber moldings (also in excellent condition) were given the once over with rubber cleaner and preserver. Once assembled they looked nice and I put in new bulbs (packed with all the pieces I received when I got the car) tested all the lights and wiring before attaching to the existing wiring in the body. Its always best to test everything if possible before mounting on the car. Likewise, the license plate lights, plastic lens and gaskets where replaced ($28.00) with new ones in the trunk lid. New license plate lights installed. Side markers only needed detailing. Replacement rubber is NLA for years, but new rubber from a Triumph Spitfire will work even though they are thicker and put the lens at more of an angle.